El Cielo Residencial, Carretera Federal – Gorgeous 3 bedroom home for sale inside El Cielo gated community, just minutes from downtown Playa del Carmen. 1 bedroom on the main floor and 2 huge private bedrooms on the second floor. This is a rare customizable home, presented by a reputable builder. Ask us about the payment schedule, it’s all planned out ! – Moen valve brand in showers and bathrooms. – safe boxes or alarms, or cctv, fire alarms. The renders are to show the decoration idea only, and is not included. Call to find out more about this terrific custom home for sale ! 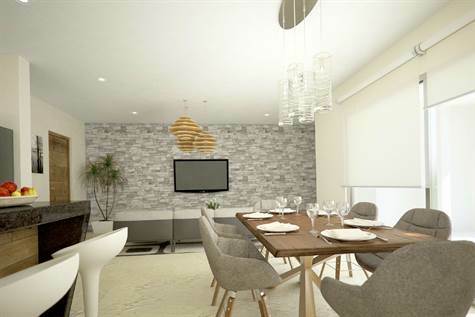 El Cielo, Playa del Carmen – This developer has launched this 4th successful project in the gated community of El Cielo. solarium with total area of 1700 sq.ft. The project is in the final stages of completion and just a few units still available. They will be launching phase 2 soon! Contact me now for more details on the pre-sale pricing / current availability. Prices subject to change without notice. Great community to live in ! El Cielo, Playa del Carmen – Finally, beautiful high quality affordable customizable homes on a lot you select, close to the beach. House of the Winding River is named for the winding river pool between all the houses and winds it way the whole length of the property. Imagine now you can swim up to visit your neighbours. Hacienda del Rio is a small master planned community of 20 haciendas ( modern) style homes and 4 condos. Each home begins with a lot of your choice and with a floor plan of your choice which is fully customizable fully. 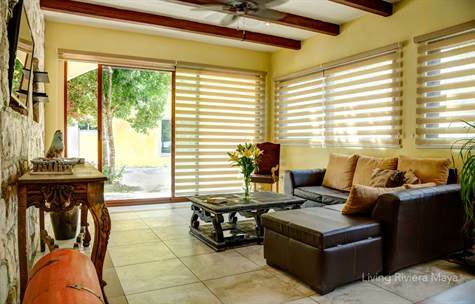 When you own at Hacienda del Rio, your home is free-standing private home and yet it has the flexibility of and peace of mind where you can lock it and go, just like a condo. No more worries of home ownership in a foreign country. We do that for you. Conveniently located footsteps away from the Beach and a 5-minute drive away from Downtown Playa del Carmen, these beautiful Playa del Carmen homes and condos for sale are built and decorated in the most exquisite Mexican Hacienda Style. Each home is built according to the wishes of the owner for size and style and number of bedrooms, on a preselected lot. Running between the homes is a long and beautiful river pool, shared by all members of the community. There is a club house and large common areas for socializing and relaxing. YES, dogs are allowed in these homes and condos for sale Playa del Carmen ! 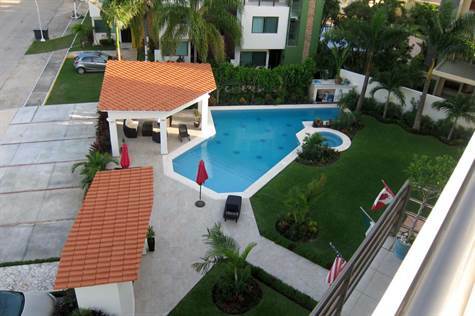 Prices for a home on a lot with shared pool, start at $225,000.00 USD. Unbelievably low price and unbelievably high quality. You have to see to believe. As a Canadian realtor living and working here for 10 years now, I could not, at first, believe these prices and sizes and finished product. Let me assure you, this really is a great opportunity. Homes are delivered completely finished, totally turn-key and exceptionally well built, including onyx sinks in the bathrooms, hand carved marble sink in the kitchen, Talavera tile or polished cement counter tops, solid wood doors and frames and much more to make an outstanding property. If you want to live in a house with space and privacy, and want peace of mind, lock-and-go ease of ownership of a condo, buying a home in HACIENDA DEL RIO is the answer. The common property and exterior maintenance are managed by the home owner’s association, relieving you of the responsibility of tasks normally involved in stand alone homes. Life for the lucky owners of a home in lovely Hacienda del Rio is very different from life in the city. We wake up to the sound of birds singing and palm tree leaves brushing against each other, rocked by the gentle ocean breeze. Weekend BBQ’s at your neighbour’s is only a short swim away. That’s right – A beautiful swimming pool runs along the central yard that connects all condos and lots, so you can swim everywhere! If the Condo lifestyle is not for you, there is an option to buy the land only and have your own Custom Home built in Playa del Carmen! There are 2 home models for the single family homesites from which to choose from. Upgrades available and adjustments such as adding an extra bedroom or studio at extra cost, changing the position of the cooking area, incorporate a pérgola or a jacuzzi,etc. Once the final modifications are defined, the developer will send a proposal to the client detailing costs and benefits. Each single family home is built on a private and titled 3,123sqft or 290m2 lot, and the interior construction starts on 1,604sqft or 149m2. Air conditioner for bedrooms and living room and dining room. El Cielo Residencial, Carretera Federal – Gorgeous complex located inside the El Cielo gated community, just 5 kilometers to Downtown Playa del Carmen, Quintana Roo. These gorgeous condos for sale are high-end and private in close proximity to exclusive hotels and shopping centers, 30 minutes to Cancun Internation airport and less than 700 meters to gorgeous Caribbean waters. Unique and exclusive condos with avantgarde design. Completely equipped, with parking, big gardens, pool, jacuzzi and all secure with security. On 4 levels with elevator. 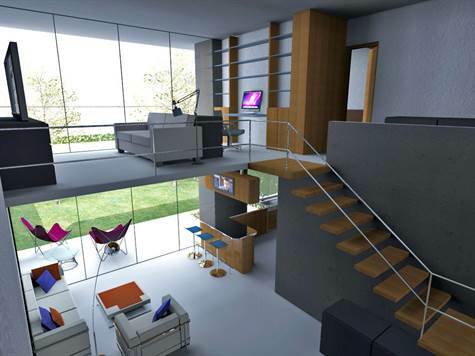 All designed for comfort and privacy, this developer understands the importance of space for living and entertaining. Terraces, individual BBQ area, garden views all within Riviera Maya scenery. Abundant windows, allowing natural light and ventilation. Some condos have private solariums, equipped with jacuzzi, BBQ, shower, pergola, bar and broad views of natural surroundings. Private parking for each condo with 24-hour security. High-quality finishings, natural stone, and porcelain floors, LED lighting, regional hardwood. Closets and mini split style A/C. Granite countertops completely equipped kitchens. Ask us about this property or any other you make want in the Riviera Maya.